As I stated before, I have wanted to build a good woodworkers bench for a long time. I bought magazines and read their ideas, I liked the thought of the 175 dollar workbench. It appealed to me not only from a cost point of view, but also as a point to how I tend to work. Having no formal training what so ever. I have learned all I know by reading, watching television shows, or by the seat of my pants. To that matter when I buy an expensive tool, my typical MO is to buy cheep and learn all I can about what I like and don't like. Then, when I am ready, I trade in the cheaper tool for a quality one, well researched and with all the features I like. This is the story with my table saw. I started with the 130$ Delta bench top version, with two side table extensions to expand the cut capacity. I beat the ever loving hell out of that saw. But I leaned to do a lot of great things on something that was not top quality. When it came time to retire it, (not because it died, in fact it runs to this day in the small work shop of my best friend) and I was ready to move on I chose a contractor style saw from Rigid. Man do I love that workhorse! and the best little boost to the pride. A month after I bought the saw, one of my woodworking magazines selected it as their top choice in that category of saw. These thought work the same for me when I want to use a tool like a workbench. My first was an old kitchen table that did not last long, then I worked with the super cheep, plywood and metal legs. Now I wanted to work with something that was meant to be a real bench. I have never really liked the French style cabinet makers benches. whether they had the worthless tool trough or not. I was not sure exactly what it was I wanted to build and then I finally saw a bench that's design spoke to me. The Nicholson Workbench in a book by Christopher Schwarz. 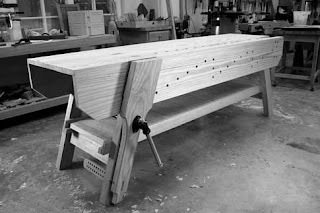 It was unlike any bench I had ever seen, I knew I liked a leg vice and an end vice and bench dogs. It was perfect. with a little modification. I wanted to maintain the inexpensive lessons I learned reading about the 175$ workbench. What if I took the design and created a stacked and side glued, thick top to the Nicholson. The only drawback I read about on the net was the thinner top made some bench dogs and accessories not work so well. Well I could fix that modification. One more thing that I feel I have to explain. I utilized construction grade pine purchased at Lowes for everything here. It was important to me that I be as frugal as possible. I purchased 30 2x4x8's a 2x10x8 and 1 2x6x8 construction grade boards and 5 1x12x8 shelf grade pine boards. My loving wife (who has ever been tortured after suggesting his hobby, though she does appreciate the benefits of a new and unique piece of furniture from time to time) and I spent the better part of two hours shuffling through two bundles of 2x4's to find the straightest and more importantly, ones without cracks, splits, chewed up edges, or giant knots. I also purchased three bottles of the polyurethane glue, to face join the boards for the top. After the glue had cured, I went to work diligently cleaning up the squeeze out with a chisel. You will see that the boards on the left have been surfaced flat and the ones on the right have not been run through yet.